Turkeys are the absolute perfect carcasses to resurrect with the magic of soup. Turkey itself rarely tastes like much of anything – my brother went to great lengths to smoke one of our Thanksgiving birds this year and as amazing as it smelled, it was still drowned out by the other foods at our feast table. But this soup could hold its own – the broth, bubbling away on the stove while you assemble the dumplings, condenses the flavor of the turkey into something golden and rich and more fragrant that you would think turkey could ever achieve on its own. If you don’t have a turkey carcass handy, feel free to use leftover roast or rotisserie chicken. It’s what the recipe originally called for, so it’s perfectly legitimate. The dumplings are a bit labor intensive, so it’s a useful recipe to pull out when you have a bit of time off and feel like puttering around the kitchen or if you have extra labor on hand. I took advantage of some visiting neighbor kids, but still found myself making more kreplach after they’d left and feeling hungry. So I don’t think it’s a great recipe to multiply haphazardly (as I did) – the labor and cooking time are more proportional to the quantity than most soups. Place the turkey or chicken carcass in a large stock pot and cover with water. Pay attention to how deep the water is – you’ll be reducing this over time to make it taste better. 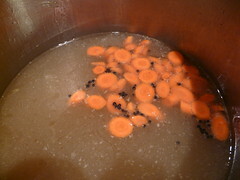 Add the sliced celery, carrot, and onion along with the peppercorns, and bring to a boil. I sliced the carrots nicely, but you can just quarter the vegetables and drop them in if you don’t feel like eating very well boiled vegetables later. This is great compost fodder, but our composter isn’t winter friendly, alas. Reduce heat and simmer for 30 minutes. If you can, watch for floating fat and foam, which is impurities from the skin and bones. Use a shallow spoon to pick that out and throw it away. 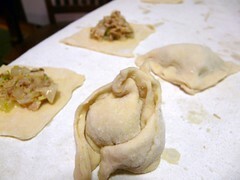 You can now get started on the dumplings – just check it now and then to see how it’s doing. When you’re sure the broth has cooked sufficiently to get all the flavor out of the turkey, carefully strain out the bones and vegetables (line the strainer with cheesecloth or – in a pinch – a clean dish cloth if you want a nice clear broth). Return to pot and cook until it’s about half the quantity of liquid you initially added to the carcass. Turn the heat down if it’s cooking away too quickly – you’ll be cooking the dumplings in the broth and they do absorb some as they go. This is basically the same recipe as most pasta. 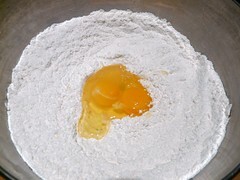 I followed the instructions in the cookbook and mixed in the egg first, then the water. 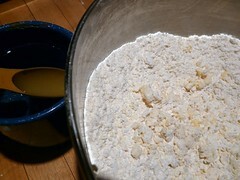 It got pretty crumbly and dry looking, so I looked up another cookbook’s instructions (good old Betty Crocker) and added very small amounts of water. The original recipe called for chicken fat, which I don’t normally keep on hand. When I saw a note that said Kreplach soup is a traditional dish for Purim, though, it made a bit more sense. My suggested substitution of bacon is definitely not kosher, but since I was using leftovers from a home-smoked turkey, I used that fat. And it added a lot of really delicious flavor. Since I don’t imagine most people have smoked turkey fat available in any way, I say use bacon. 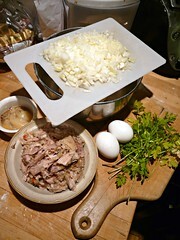 Or go the healthy route and use canola oil, but you may want to play with some herbs and salt to get a bit more flavor. At any rate, you cook this up by heating the fat or oil in a small frying pan and fry onion until soft and transparent. Then you add the meat and cook well if you’re starting with raw meat or just mix it in if you have cooked meat. Turn off the heat, mix in the remaining ingredients, season with salt and pepper, and you’re ready to get to the fun stuff. 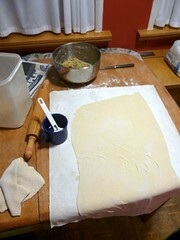 First, Roll out the kreplach dough as thinly as you can and cut into 3″ squares. Mine, as you can see in the illustration, was rolling right off the table. Obviously I shouldn’t have doubled the recipe and tried to do all the dough at once. 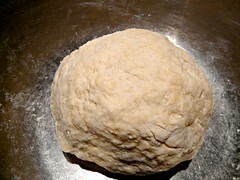 Next, Drop a teaspoonful of the filling into the middle of each square, brush the edges with a little water. I find it helpful to make this a division of labor – one person mans the filling with a spoon and a bowl of water and pastry brush, another person handles the shaping. 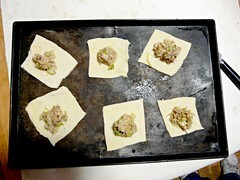 To shape the dumplings, fold over the corners diagonally to make a triangle, pinching the edges to seal. Bring the long points together and pinch firmly to make a ring. (The same shape as tortellini). Leave to rest for 15-20 minutes. 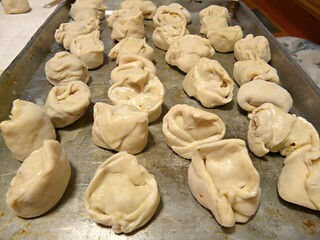 This is where I really ran into trouble with my doubled recipe: my kreplach were absorbing the broth so quickly as they cooked that I was afraid I’d have dumplings and watery gravy, not dumpling soup. My solution was to cook the first batch up and eat a bowl of soup right away (I was hungry after making all those dumplings on a weeknight after work). 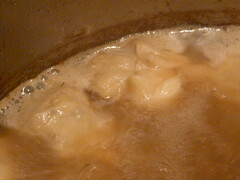 Then I diluted that wonderful broth with whatever packaged broth we hand on hand and cooked the rest of the dumplings. It didn’t really compare to the carefully simmered broth, but we had food to eat for several days. The kreplach are even pretty good cold, though not as good as they are hot.